Within our trusted community of professionals looking to buy and sell, message response rates are twice as high as the response rates on LinkedIn. Today, Koble, a leading global business matchmaking platform, officially released TrueReview for buyer and suppliers. With the launch of TrueReview, Koble is now making B2B business reviews possible via a simple user interface. Koble members can now provide trustworthy reviews of suppliers and clients via their authenticated work email. In addition, members now have the option of leaving reviews under varying degrees of anonymity to empower more honest feedback without harming professional networks. Company reviews are also product and market specific, which will positively impact how users find and gain access to highly targeted content within Koble’s content feed. In addition, the reviews will provide more information about the buyer and supplier, while continuing to maintain a high degree of privacy. 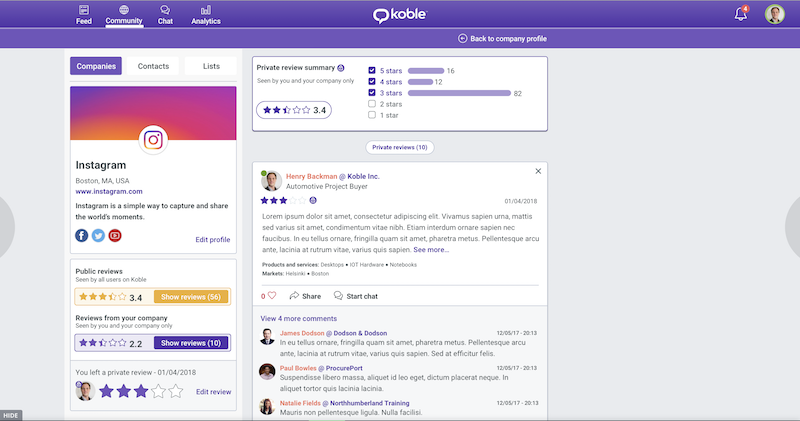 Koble allows companies to promote their businesses and more effectively discover vendors, and the review feature will make that process more seamless. A buyer friendly community where content sparks meaningful conversations, Koble promotes authenticity, privacy and relevance to help professionals uncover genuine business relationships. On the app, a match is created after a user has shown interest in the content posted by another user or by viewing its profile. From here the user can start a chat with their match and convince them to reveal their identity. When successful, users are free to connect, meet and freely communicate. By keeping the personal identity of interested users anonymous on one side and removing the need for introductions on the other, we protect users identity while taking away the awkwardness out of networking. Koble is headquartered in Boston.To learn how Koble can help you make more valuable business connections, visit http://www.koble.com.